If you own a car, it probably makes noises you can’t identify, but would love to fix. Car noises are not just annoying: sometimes they are a warning sign, like the calm before a storm. Here are the four car noises customers most commonly complain about. Sometimes noises are hard to identify, because a noise travels throughout the vehicle and it is hard to pinpoint where it’s coming from. But with a trained ear and some insight, we should be able to figure out what is causing the noise in your car and what you can do to fix it. If your car is making a clicking noise when turning, it is likely you have an outer CV joint (constant velocity joint) that has failed because of a torn boot or old age, most likely a torn boot. Without going into too much detail about what a CV joint is, I will just give you a basic idea of its function and why it might have failed. A CV joint is a set of ball bearings at the inner and outer ends of an axle. It lets a spinning axle bend while it’s still spinning (see this cool animation if you like). A rubber “boot” covers the entire joint and protects it from dirt, debris, and moisture, while holding in the grease that lubricates the ball bearings. Over time, since it’s just rubber, the boot becomes brittle and dry. Eventually it will split open and allow specks of dirt and debris to enter the joint. Once foreign matter mixes with the grease, the damage begins, and it is only a matter of time before the CV joint starts to make a clicking noise when turning. This clicking noise while turning will start out faint, but gradually it will become noticeable and eventually very loud. The only way to fix this condition is to replace either the whole axle assembly or the outer CV joint. 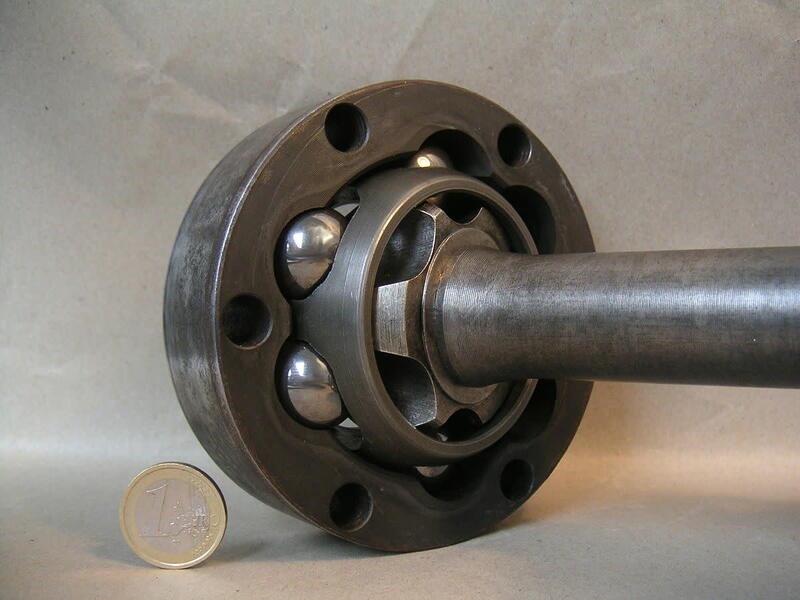 My professional opinion is that it’s better to replace the entire axle assembly; it’s usually cheaper, even if you can even find the outer joint sold by itself, and it doesn’t make much sense to mix old parts with new parts. Water pump noises are very difficult to diagnose, because the water pump is generally buried deep in the motor, and the noise will resonate through the engine making it difficult to identify. The water pump on your engine is a thick metal casting containing a pulley, pump fins (a palm-sized propeller to push the water along), and a bearing set. When a water pump fails, the noise is usually caused by damage to the bearings. The video here on this page is a great example of what a noisy water pump sounds like. The only fix for a noisy water pump is to replace it. Because of its location (often under the timing belt cover and bolted to the engine block), an awful lot of parts have to be removed to get to it, so it can take several hundred dollars worth of labor to replace a $50 part. If it is nearly time for a routine timing belt replacement (every 60,000 to 105,000 miles or so depending on the car), you might want to have that done at the same time as the water pump, because timing belt service is one of the rare occasions when a water pump is easy to get to. In fact dealerships will often want to replace your water pump routinely, whether it’s worn out or not, as part of a timing belt service. In the video below the mechanic uses a screwdriver like a stethoscope, pressing it against the hub of a wheel to listen to a wheel bearing noise. Engine belts can create a loud, high-pitched squeak or squeal that will drive you and your neighbors crazy. Some engine belts only squeak after you go through a large puddle or if there is heavy moisture in the air, and others squeak constantly. If your engine belts squeak only when damp, you probably only need to have the belts adjusted. If your belts squeak constantly, they may be dry, cracked, or loose, and probably need to be replaced. Some folks like to use a spray called “belt dressing” to stop the engine belt squeal or squeak. Keep in mind that this spray will not fix anything permanently. It is, however, a great tool for diagnosing the noise and finding out which belt the noise is coming from. If you have belt dressing, this is what you do: when the engine is running, just spray it on each belt to see which belt starts to quiet down. Inspect your engine belts for cracks, damage, and tension, and replace or adjust them as needed. A heat shield noise is a type of rattle you hear while your car is idling, or at a specific engine speed or RPM. Heat shields are metal plates along the exhaust system of your car that deflect heat away from the floor of your vehicle and other heat-sensitive components like fuel tanks, wiring, and brake lines. As the exhaust system ages, sometime the heat shields start to rust at the hold-down points and become loose. If this is your problem, the engine vibrations will cause an awful noise as you’re sitting at a stop light or as your car is idling in the driveway warming up. It sounds like rocks being shaken on a cookie sheet. Heat shields can become damaged due to road debris, snow banks, automotive lifts, and just plain old age. In some cases, a damaged heat shield can be removed temporarily without causing any repercussions, but it’s best to replace them as soon as possible. An automotive exhaust system can become extremely hot, even 1000o Fahrenheit if you are running your engine at high RPM for long periods, like on the highway. Car noises are inevitable; even new cars have noises that need to be fixed. Here’s a little tip that not too many people know about. When buying a new car, if possible, find out what day it came off the assembly line. Watch out for cars built the day before a holiday, or on a Friday afternoon. It may sound funny, but humans are building these vehicles, and you know what happens at 5 o’clock on Friday or at closing time the day before a holiday: we rush our work so we can head home to relax or prepare for the holiday. This is not a fact I found in a documentary or anything, it’s just my experience. When our shop saw new cars with a lot of little problems, it seemed like they were always built on these out-the-door days. There are a lot more car noises than what is outlined here in this article, and it would take a lot more time to explain every one of them, so I only covered the noises my customers complain about the most. Just remember, noise could be a warning sign, so if you have a noise in your car that you are unsure of, bring it to your trustworthy mechanic to have it checked out before it costs you even more money. If you have a noise in your car and you can’t seem to figure it out, ask me about it in the comment box below and I will answer your question as soon as possible. If you found this article helpful, please share it on Facebook or Twitter, just click the buttons at the top of the page. Thank you, I really appreciate it. What Is a Wheel Bearing? Diagnosing a Wheel Bearing Noise. Your mechanic says you need a wheel bearing. What’s a wheel bearing? Pictures, video, and my own interpretation of what a wheel bearing is, what its job is, where it’s located, and the noises it makes. Steering Wheel Vibration: My Car Shakes While I’m Driving. If your steering wheel vibrates, or your car shakes while driving at highway speed, find out why. Don’t spend money unnecessarily on an alignment or other services that won’t fix this problem. Four Common Brake Squeaks. if your brakes squeak, and you want to know why, maybe I can help! Here are four common brake squeaks plus a bonus scraping noise; compare these situations to yours. Questions are welcome.